And be sure to check out our Web Only interview with Inside Climate News Reporter Marianne Lavelle about the implications of pulling out of the Paris Climate Accord and another blockbuster announcement May 31: the vote by Exxon shareholders to compel the company to report the impact of climate change on its bottom line. Eleanor Roosevelt was one of the towering figures of the twentieth century. She was the only First Lady who was also a political force, diplomat and activist in her own right and moreover, one who always championed the rights of the downtrodden. But she had a secret: her love affair with journalist Leonora Hick. The two women could not have come from more disparate backgrounds, yet they shared a common history of childhood pain. And they shared much more than that. They were partners in revealing the desperate conditions of so many Americans during the Depression. The results of their fact-finding tours during FDR’s first administration had a great impact on his New Deal policies. 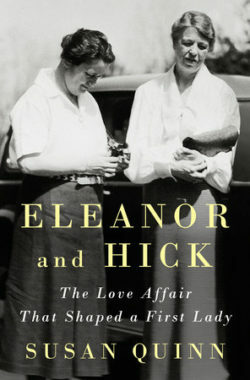 Susan Quinn tells this story wonderfully in her book Eleanor and Hick: The Love Affair That Shaped A First Lady. It’s been listed among the 5 best biographies of Eleanor Roosevelt. Quinn is the author of Furious Improvisation: How the WPA and a Cast of Thousands Made High Art Out of Desperate Times and Marie Curie: A Life, among other books. Her work has appeared in The New York Times Magazine, the Atlantic, and other publications. Eleanor and Hick is out from Penguin Random House. Let’s not mince words here. We are in a climate emergency. The Paris Agreement didn’t go far enough, but it was a start. Trump’s move to pull out would be full speed ahead in the wrong direction. With that in mind, let’s listen back to our 2014 interview with Naomi Oreskes about the book she co-authored with Erik Conway, The Collapse of Western Civilization: A View From The Future. It’s a science-based speculative novel about the consequences of our current inaction. WV interviewed her just before the historic People’s Climate March that took place in NYC and around the world in September, 2014.